Diane T. Nhan, O.D. therapeutic optometrist, practices family eye care at a full-scope optometric practice in Corpus Christi on Saratoga Blvd. Dr. Nhan earned her Doctorate of Optometry from the Illinois College of Optometry in Chicago in 2004 which was preceded with receiving a Bachelor of Science degree in biology in 1999 from the University of Houston. 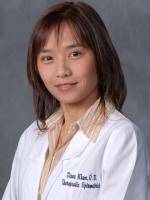 Previously to opening her own TSO office, Dr. Nhan practiced as a therapeutic optometrist in Corpus Christi. She offers patients comprehensive eye exams, glasses prescriptions and contact lenses. She is also licensed to diagnose and treat eye diseases. Dr. Nhan is committed to building solid relationships with her patients and their families by providing excellence in eye care and quality eyewear.